Margaret K. McElderry Books, 9781416906582, 272pp. Fifteen-year-old Dylan has horrific visions of the last moments of a child's life -- a child who has been abducted, kidnapped, or worse. Dylan gives the police valuable clues that help them to find children's bodies, but she keeps the most personal information about these young victims to herself. Dylan has become used to withholding her sight abilities -- even from her best friend, Pilar -- but the weight of that secret is becoming almost more than she can bear. Then Cate moves into Dylan's mountain town. Enthusiastic and friendly, Cate seems genuinely interested in Dylan, who begins to reveal a bit about herself. But is Cate all that she seems to be? It's not entirely clear...and it takes the disappearance of Pilar's little sister to finally open Dylan's eyes. In a race against time to save a life, and desperate to focus her abilities so that she herself can survive, Dylan is forced to see more clearly than she ever has before. 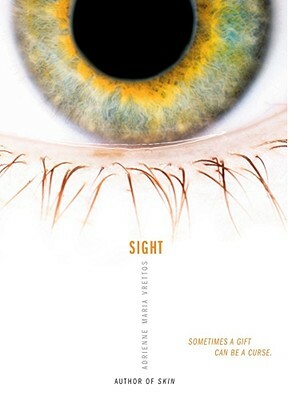 Sight is a powerful and haunting story from the author of the highly acclaimed debut novel Skin. It will open the eyes of readers everywhere. Adrienne Maria Vrettos grew up on a mountain in southern California, where she rode dirt bikes and made a mean double-mud pie. Her first novel, Skin, was named an ALA Best Book for Young Adults, an ALA Quick Pick for Reluctant Young Adult Readers, and a New York Public Library Top 100 Books for Reading and Sharing selection. Her second novel, Sight, was an ALA Quick Pick for Reluctant Young Adult Readers and a New York Public Library Book for the Teen Age. She is also the author of The Exile of Gigi Lane and Burnout. Adrienne lives with her family in Brooklyn, New York, and you can visit her online at AdrienneMariaVrettos.com.